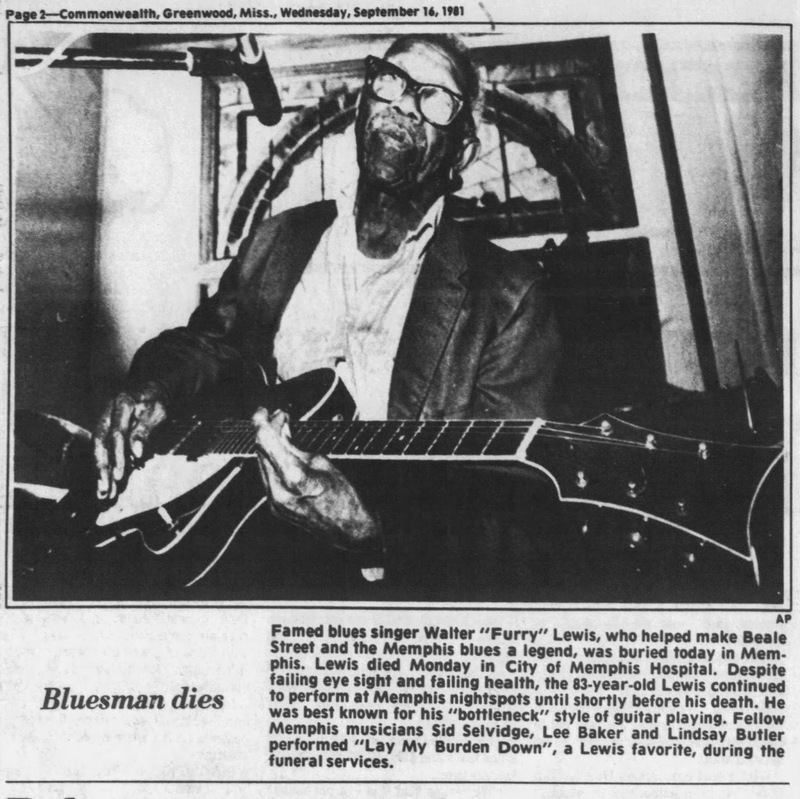 MEMPHIS — Furry Lewis died this month, and the tradition of the blues has lost a major force. Furry was up in years, in poor health, with a wooden leg, and he died after lapsing into a coma following a heart attack. 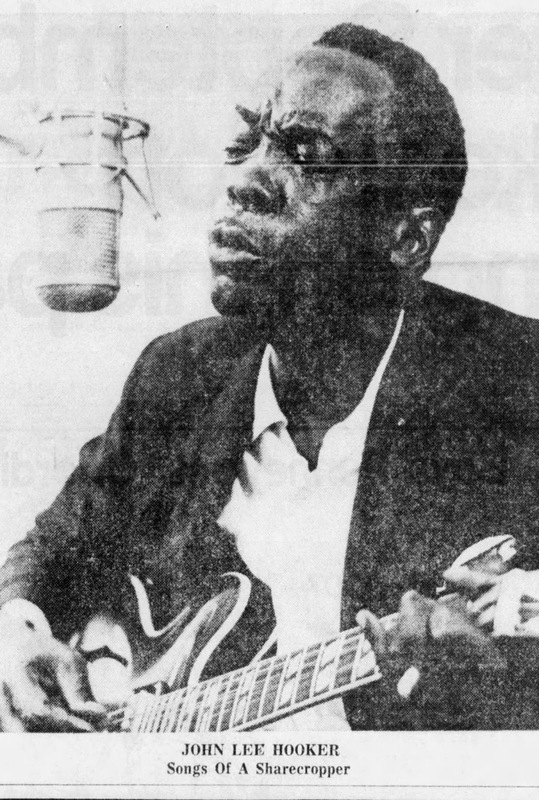 But he was well-known among Memphians and among aficionados of the blues as one of the founding fathers of the Beale Street sound. Furry started out, he used to say, with a cigar box and broom handle for a guitar. 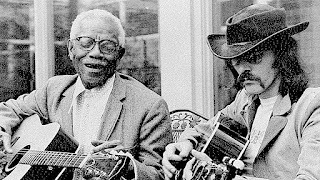 By the time he was in his 80s, which was when I knew him, he played an old six-string with frequent use of the bottleneck, which he developed to a high art. A so-called bottleneck is actually a steel cylinder which fits around a finger and is slid up and down the strings for a whining, haunting effect. When used poorly it has been said to resemble cats fighting. But I never heard Furry use it poorly. We used to go to Furry's house on cold winter evenings. I would carry my guitar in hopes of learning a few techniques from a master of that instrument. 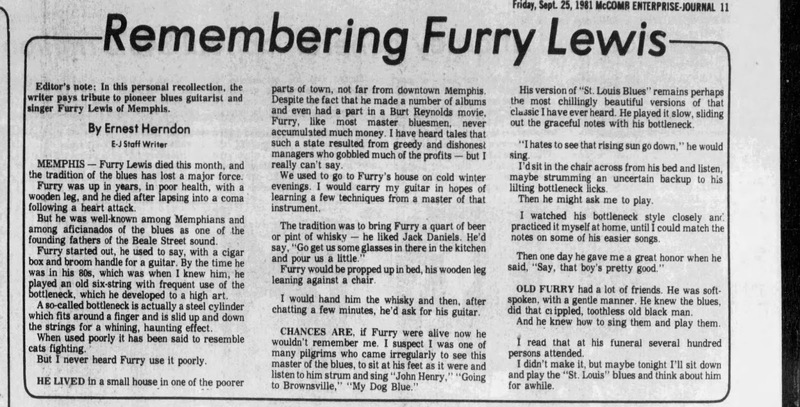 The tradition was to bring Furry a quart of beer or pint of whiskey — he liked Jack Daniels. He'd say, "Go get us some glasses in there in the kitchen and pour us a little." Furry would be propped up in bed, his wooden leg leaning against a chair. I would hand him the whiskey and then, after chatting a few minutes, he'd ask for his guitar. CHANCES ARE, if Furry were alive now he wouldn't remember me. 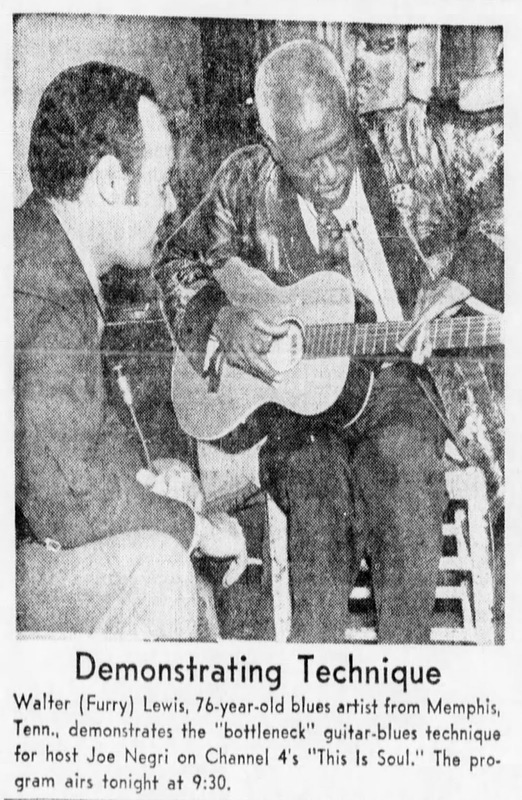 I suspect I was one of many pilgrims who came irregularly to see this master of the blues, to sit at his feet, as it were, and listen to him strum and sing "John Henry," "Going to Brownsville," and "My Dog Blue." His version of "St. Louis Blues" remains perhaps the most chillingly beautiful versions of that classic I have ever heard. He played it slow, sliding out the graceful notes with his bottleneck. "I hate to see that rising sun go down," he would sing. I'd sit in the chair across from his bed and listen, maybe strumming an uncertain backup to his lilting bottleneck licks. Then he might ask me to play. I watched his bottleneck style closely, and I practiced it myself at home until I could match the notes on some of his easier songs. Then one day he gave me a great honor when he said, "Say, that boy's pretty good." OLD FURRY had a lot of friends. He was soft-spoken in a gentle manner. He knew the blues. And he knew how to sing them and play them. I read that at his funeral several hundred persons attended. I didn't make it, but maybe tonight sit down and play the "St. Louis" blues and think about him for a while. Sid Selvidge and Arne Brogger were two of the contributors and music lovers who funded both the upright marker and the smaller footer in the summer of 1983. The marker remains atop his grave. In 2016, the Mt. Zion Memorial Fund marked another grave inside the cemetery and straightened the thick marker of Furry Lewis. Of all the events in Robert Johnson’s short life the one that might have had the most impact may have been the death of his young wife, Virginia. Robert and Virginia Travis were married in Penton, Mississippi, on February 17, 1929. They lied on their marriage record, Robert claiming he was 21 and Virginia stating she was 18, when he was really 17 and she was only 14. 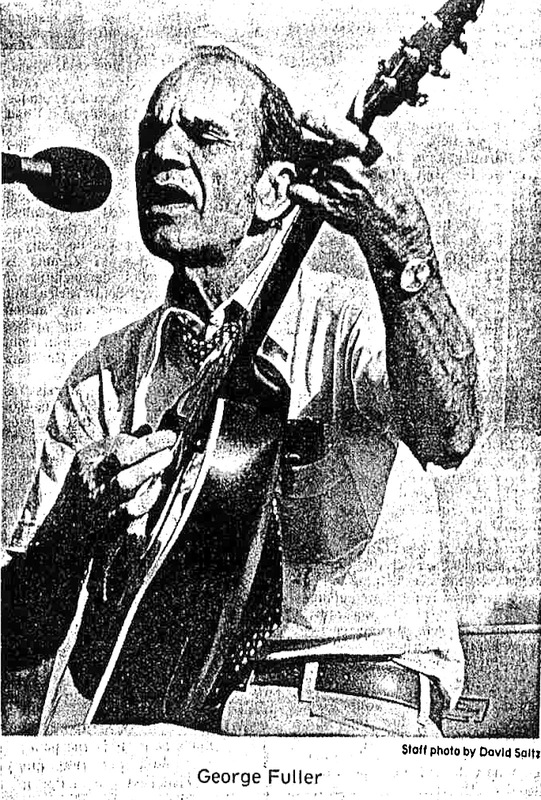 Johnson had already been a performer before getting married, but apparently, he loved his young wife enough to put his music playing on hold and try family life and farming, an occupation from which he had always run. 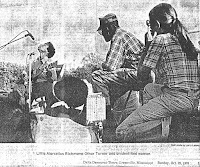 The young couple moved to a farm in Bolivar County, Mississippi, where Johnson’s older step-sister Bessie and her husband, Granville Hines, were living. There the couple lived for over a year until a pregnant Virginia decided to leave Robert and the farm to have her baby in her family’s care in Penton. Virginia died in childbirth at two a.m. on Thursday April 10, 1930, without Robert at her side. 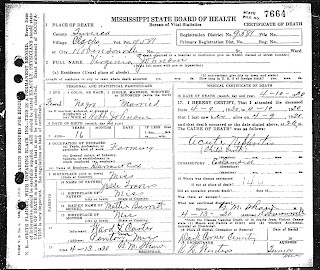 G. M. Shaw of Robinsonville listed her cause of death as “acute nephritis [child birth], eclamsia [ sic ].” She and her baby were buried shortly thereafter in Dark Corner Cemetery. He may have taken their claims to heart. 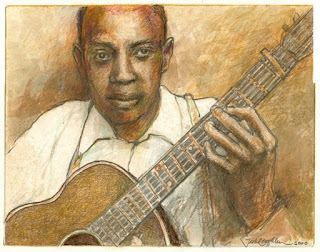 Whatever the case, after Virginia’s death Robert Johnson embarked on a life of travel, womanizing, drinking, and music. But exactly where was Virginia when she died, and where was she buried? Just where is Dark Corner Cemetery? 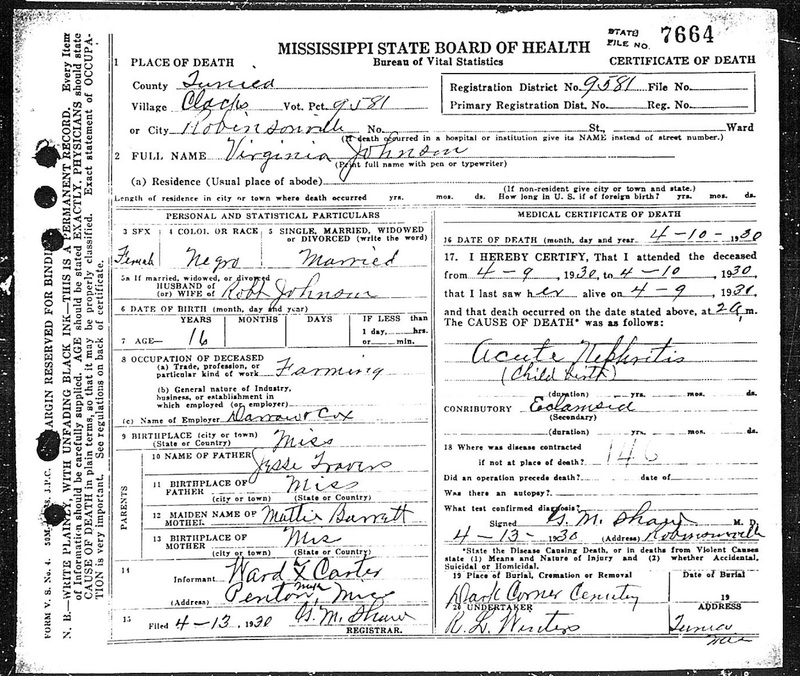 Attempts to find any record of Jesse or Mattie Travis, Virginia’s father and mother as listed on her death certificate, have thus far come up empty. So did Virginia go to her parents’ home to have her baby, or did she head to some other location? Another 1930 census record, this one from Monday, April 7, provides the answer: Virginia was staying on a cotton plantation in Penton with her grandmother, Lula Thomas, along with five of Thomas’ other grandchildren. Her parents may not even have been with her when she died. The April 7 census record is the last formal acknowledgment of Virginia while she was still living. No one knew that she and her unborn child would be dead in less than 72 hours. And Robert Johnson had not yet arrived in Penton. One has little success if one tries to find any historical records of Dark Corner Cemetery in Mississippi, but the director of the Tunica Museum located an undertaker in Tunica who recalled that Dark Corner Cemetery was the previous name of the small cemetery just behind the current Rising Sun Missionary Baptist Church on Green River Road, off Old Highway 61 in Penton, just over the Tunica/DeSoto County line. Although her grave marker, if one ever existed, is either gone or overgrown, here rests Virginia Johnson, Robert’s wife, and their only child. The Rising Sun MB Church is listed as another name in local cemetery records as well as on the below map. It was apparently called "Dalkhorn Church" by someone at some point, and the grave of Virginia Travis is actually sitting unmarked in Dalkhorn Cemetery. 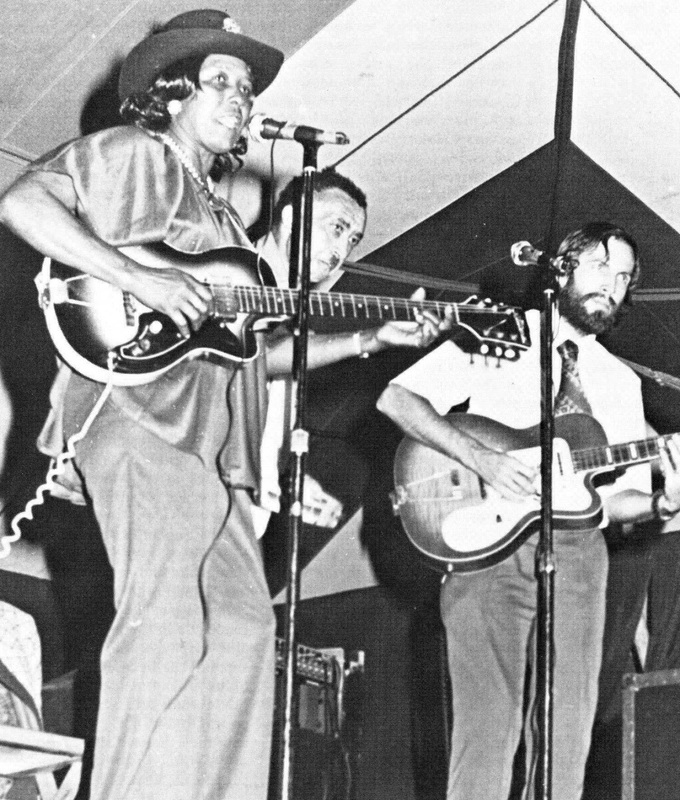 Mississippi blues musicians revive an old art form through festivals and recordings. Hammie Nixon, blues singer, harmonica player, and jug virtuoso from Brownsville, Tennessee, was clearly enjoying himself, even though a free concert at the Smithsonian Institution was small potatoes for the former partner of legendary blues man Sleepy John Estes. "You know, when I go to Tokyo, 2,500 people meet me at the airport," he mused, recalling the heyday of his 58-year career with Estes. "It's a funny thing how you have to go 'cross the water to be a star." Nixon's experience is not unique. For most blues musicians in recent decades, fame has been found in faraway places. Here at home, ironically, this truly American musical form has been largely ignored. Often considered the roots of jazz, the blues in fact have their own parallel history. Certainly a major ingredient of jazz, they have also had a profound impact on rock-and-roll, on gospel music, and on country-and-western music. 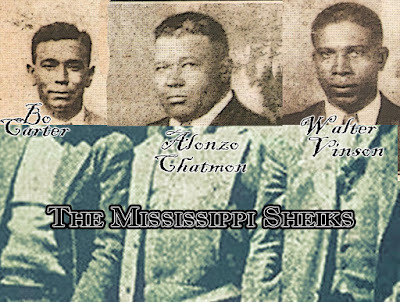 What we know today as the blues evolved around the turn of the century from the work songs, love songs, slow drags, and spirituals that were the musical expression of black life and culture along the southern Mississippi River. The rural folk sound was quickly popularized by black musicians. By World War I, the blues were a commercial success. During the 1920s and '30s, with the rise of composer and band leader W.C. Handy and such singers as Bessie Smith, the music was the heart of a flourishing club scene and a recording industry centered in Chicago and the mid-South. Boisterous Beale Street in Memphis was to blues what Bourbon Street was to jazz. Blues remained strong through the mid- to late-'50s, when jazz, rhythm-and-blues, and later soul music began to make inroads with black audiences. With the growth of the civil rights movement, the blues came to represent old ways and hard times that upwardly mobile, urban blacks sought to put behind them. "Soul music expressed the values of young people who wanted to get ahead, whereas blues seemed to express a down-and-out mentality, a view of life that says things might get better but they might just as easily get worse," explains David Evans, an ethnomusicologist at Memphis State University, who is working to preserve the blues. "Soul music says, 'We're going to make things better.' "
Once-popular blues performers are now getting on in years, and there is no promising future to entice the young. The recordings are chiefly of established stars, such as B.B. King, or limited editions aimed at collectors. The club scene has virtually vanished, except in certain parts of Chicago and the San Francisco Bay area. In Memphis, "Birthplace of the Blues," Beale Street is a ghost town of burned-out, boarded-up shells. Be-cause the street's raunchy reputation lives on, the citizenry is reluctant to rebuild. "Blues are associated with poverty, low-class living, back alleys, hard drinking, and rough places," says David Evans. "This is true also of other music, like country-and-western, but because that industry is well-organized, it can present a clean image through TV shows. The blues don't have that advantage." 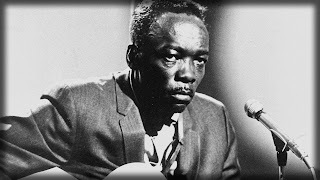 As though to play it safe, many blues singers inject some gospel music into their repertoires. 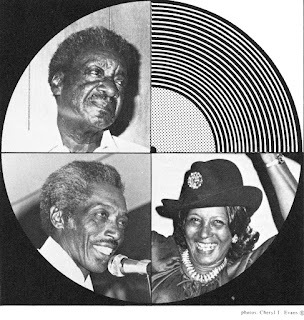 "These blues are something the Devil told us to get out and do," says singer and guitarist Jessie Mae Hemphill, introducing a spiritual, "but we don't want to leave God out. an ethnomusicologist at Memphis State University. Though their commercial popularity has waned, the blues remain strong in the rural backwaters of Mississippi. There they meld with other folk music, such as that of the fife-and-drum bands, a legacy of blacks who served in the militia during the Civil War and who later added syncopation to the march rhythms to create a dance beat. Important to the folk art of the region are the homemade instruments—hand-whittled drum sticks and fifes made of cane hollowed out with a hot poker—and such household items as can be pressed into musical service. Bottles, jugs, wash-boards, hatboxes—virtually anything can be blown, thumped, or clanked to provide some musical accompaniment. "When I was a little girl." 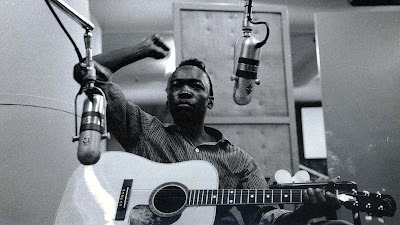 recalls Jessie Mae Hemphill, "I used to get me the flavor bottle to make a drink, and the bottle tasted so good, I just started blowing on it. Then I found out if I filled it part way with water, it sounded different." One of the most intriguing inventions of down-home musicians is the "diddly bow," a piece of baling wire or broom wire strung between two bottles that are usually attached to the side of a house or barn. The bow is played by plucking the wire and by sliding a bottle along it in the manner of a steel guitar. Thanks to a recent revival of interest in the musical heritage of the Mississippi Delta, traditions like the diddly bow are being passed on to new generations. This renewed interest, along with a burgeon-ing festival scene in the mid-South and the promise of some local recording popularity, are slowly bringing the blues back into the limelight. Youngsters delight in the sounds of the Annual Music Heritage Festival in Memphis. One key to a blues revival, says David Evans, is a commercial outlet for the music on its home turf. And in music today that means a record—specifically a "single" that plays on the radio and the jukebox. "Blues singles are almost entirely devoted to a few established stars who have been around for 20 or 30 years and who all have their own fol-lowing," says Evans. "The record com-panies almost never try to break in a new blues singer. But I am convinced, and many of the singers are convinced, that if they could get a record out, it would sell." In a one-year pilot project funded by the Endowment's Folk Arts Program and designed to test the local blues market, Evans is producing singles by five northern Mississippi singers—Jessie Mae Hemphill of Como, Ranie Burnette of Senatobia, R.L. Burnside of Cold-water, and Raymond and Lillie Hill of Clarksdale—performing both traditional and original numbers that they are identified with locally. 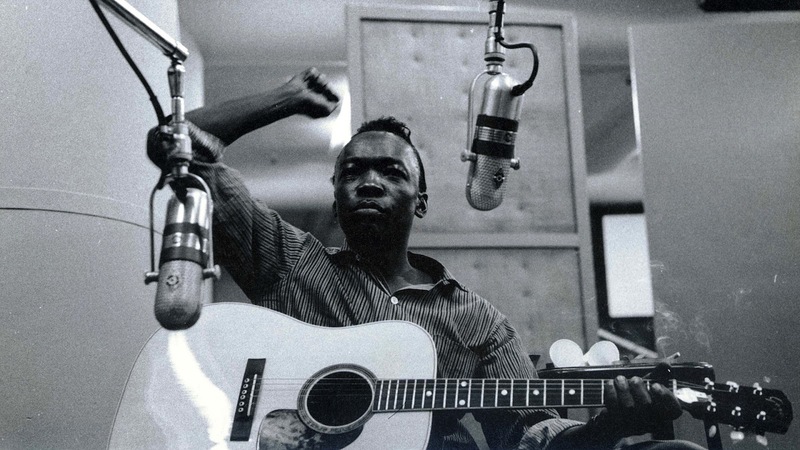 With titles like "Hungry Spell," "Bad Luck City," "Cotton Fields—Boss Man," and "Standing in My Doorway Crying," the songs, new and old, reflect the pain and hard times that gave birth to the blues. Starting with a thousand copies of each record, Evans is targeting distribution not just to radio stations, jukebox companies, and record stores in northern Mississippi but also to the general stores and Western Auto stores where the musicians and their friends trade. In Clarksdale, the public library, which has a blues museum, has scheduled a reception and autograph party for the town's new recording personalities, Raymond and Lillie Hill. Evans also plans to tap the national and international market through ads and reviews in blues and folklore journals, but he expects that "at least half the sales will be local. The mail-order distribution will be gravy that helps make the project feasible." The idea, Evans says, is to foster appreciation of the blues, especially among younger people, and to bring some prestige and income to the singers. "It should have a great impact in the community that a local person has a record out that is available locally and that can be heard on the radio or the jukebox," he says, "I hope the project will generate enough income for us to press more copies and to produce new records. I hope, too, that it will have enough success to stimulate some of the commercial companies to get more involved in the blues." Increasingly, popular music and arts festivals, such as the annual Beale Street Festival and Memphis Music Heritage Festival, are helping to boost the blues. The major showcase for local talent is the Delta Blues Festival in Greenville, Mississipppi, which started as a simple get-together for blues artists in 1978 and has grown to an annual event attracting more than 7,000 fans. Sponsored by Mississippi Action for Community Education (MACE), a rural development organization, and funded by the Ford Foundation, the Endowment's Folk Arts Program, and the Mississippi Arts Commission, last year's festival featured 25 blues artists in a day-long program. An indoor club accommodated im-promptu performers. This year's event, scheduled for September 5-6, will include seminars and workshops and a Friday-night festival on Greenville's colorful Nelson Street before the main festival on Saturday. 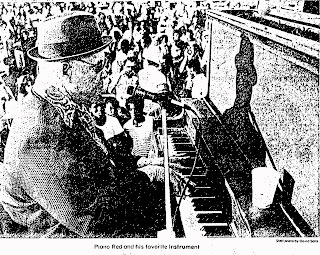 By 1981, MACE plans to take the Blues Festival on tour. Eventually, the organization hopes to make the project self-supporting through sales of a record album and rentals and sales of two video documentaries of Festival '79 that were produced with a grant from Mississippi Educational Television. This increased visibility for local artists, along with changing times and changing attitudes, has rekindled an appreciation of the blues among many Southern blacks, according to David Evans. "Some of the struggles of the '60s and early '70s have been won in terms of political, social, and economic gains for blacks, so they can be a little more comfortable with this kind of music," he says. "And in the past two or three years, with the impact of programs like Roots, black people—and white people, too—are able to take a more objective view of their cultural heritage. They can see that the blues were a product of their time but that they also have a universal appeal beyond the black community." Much of that appeal stems from the fact that the blues, like any enduring folk music, reflect what happens in people's lives, says Vanessa Greene, director of MACE'S Delta Arts Project. "The blues speak to folks." Back in 1960 when John F. Kennedy ran for President, his platform called for a "New Frontier." Ernie Lubiani, of Memphis, believes In new frontiers too, but his subject is tourism not politics — and his "New Frontier" is Clarksdale. Lubiani lived in Clarksdale when he was a small boy, his parents moved to Memphis, but he still has relatives here. He read about the Carnegie Public Library's Delta Blues Museum in a newspaper and decided to come down and look it over. Lubiani minces no words in expressing his feelings about the museum, located at the Myrtle Hall Branch of the library system. "What you have here is probably the best idea I've ever seen for this community," Lubiani said. And Lubiani knows a good tourism idea when he sees it. Lubiani had a degree in restaurant and motel management when he decided to return to Memphis State to study tourism. He has a degree from the university In that subject, the first tourism degree the school ever awarded. After graduation, Lubiani founded Hospitality Services, a Memphis tour service, that handles the most popular Elvis Presley tours. "Elvis Presley's death awakened the world to what is in this area," he said. Lubiani said that since Presley's death three million people have visited Memphis and those people have spent $385 million. "That's new money," he said. "It' didn't exist in the community before." Lubiani is planning to bring some of that "new money" to Clarksdale. 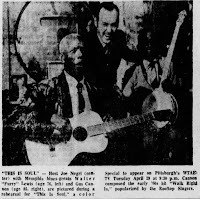 He was in town last week to take a look at the items that will be displayed in the blues museum's first big exhibition May 15. 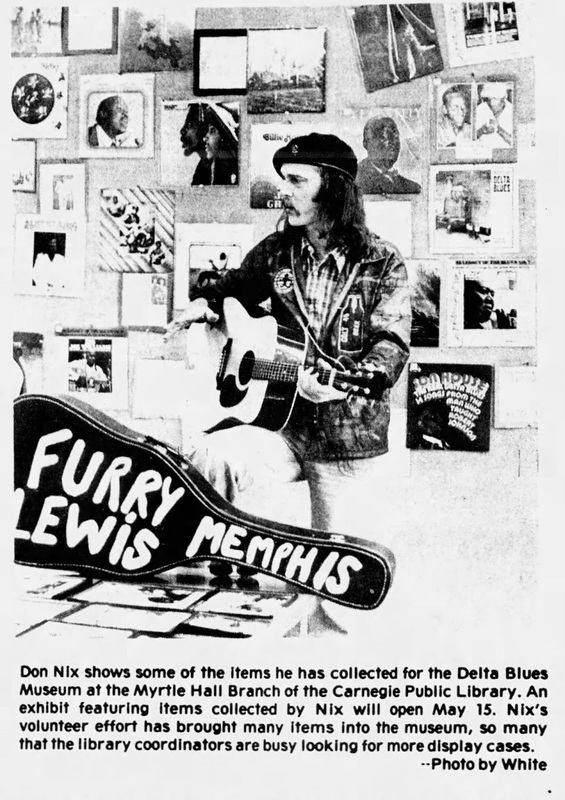 The items were collected by Don Nix, a Memphis record producer, and the library staff. In the next two months, Lubiani will be putting together a tour package linking the Delta Blues Museum to tours starting in Memphis. The local Chamber of Commerce is providing figures for Lubiani on the price of meals and hotel rooms for the tourists. 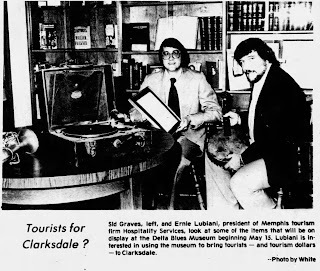 Lubiani is hoping to bring many European tourists to the Memphis/Clarksdale area. He says that this type of tourist has been to New York and Washington D.C. and is looking for more of America to see. The draw of Elvis Presley may at-tract that tourist to the Memphis area, and any music lover would want to see the "birthplace of the blues." The impact of tourist dollars could mean a new avenue of income for the city, especially needed in this time of economic instability. "Every dollar spent in Clarksdale is going to turn over two and a half times," Lubiani said. And the incoming tourists will provide a bonanza for fast food stores, restaurants, motels, and something Clarksdale hasn't had much of — souvenir shops. Lubiani would like to see each bus load of tourists spend as much time as possible in Clarksdale. "The more days they spend in town the more dollars they will spend," he said. "They'll walk around downtown and shop, buy souvenirs." "The smallest amount spent would probably be $400," Lubiani said. "That's if a tour just stopped in town for lunch, and it's just one tour." Lubiani said the incoming European tourists would probably require interpreters and local people with talent in various languages could find a place for added income. He said the tourists might cause local Clarksdale folks to become more interested in the blues tradition. "They're more knowledgeable in the blues than we are," he said. "They'll tell you about Muddy Waters and W.C. Handy." 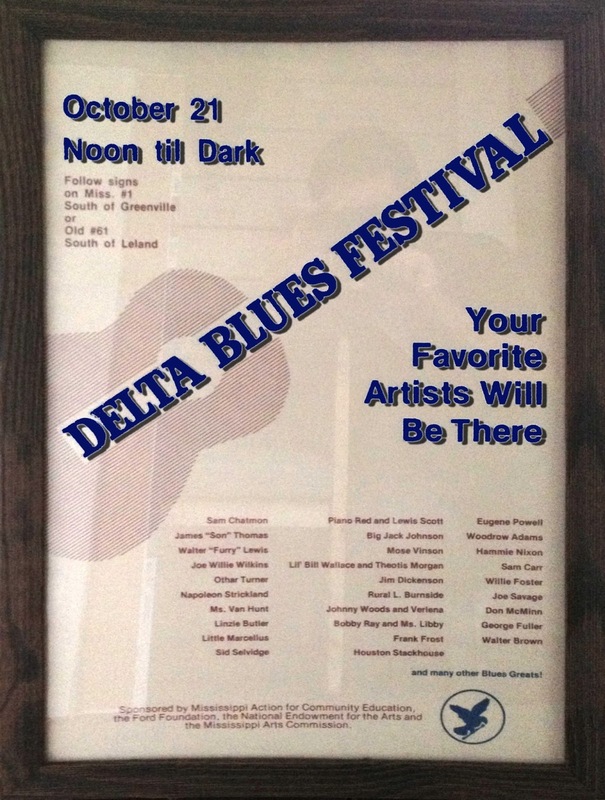 "You don't realize the value of what you have in the Delta Blues Museum," Lubiani said. "People can have a little more self-pride, stand a little taller." "Nashville may have country music," Lubiani said, "but we've got the blues." Slightly over a year ago some folks over at the Carnegie Public Library came up with a good idea — a blues museum in Clarksdale. Now, only a month before the grand opening of the museum's first major exhibition, a Memphis man with music credentials stretching through two decades is helping to turn the idea into a full scale reality. Don Nix, a musician and record producer from Memphis, has turned into a blues hunter for the museum, and during the past month has collected an impressive number of items that will be displayed beginning May 15. Among the varied items are a saxophone once owned by W.C. Handy, overalls and a jacket donated by former Beatle George Harrison, and instruments owned or made by early blues artists. Nix came to Clarksdale several months ago to visit Danny Green, a local musician. He heard about the museum and decided to take an active volunteer role. He began searching for blues musicians, their old instruments, and any pictures he could find. 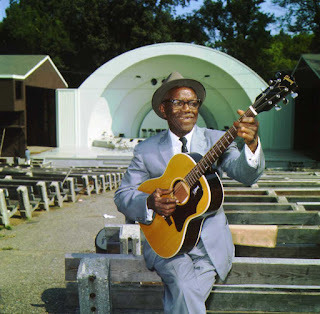 That search has turned into a literal blues gold mine for local Blues Museum backers. Nix describes his blues search as a matter of beg, borrow and buy. "Some people donated or loaned the items," he said. "If it was really good 1 just went ahead and bought it." "Everybody I talked to in Memphis wants to see it really happen down here," Nix said. "They like what we're doing here because Memphis isn't going to do anything. But some Memphis politicians seem to be at least aware of the fact that many items reflecting blues history are crossing state lines. Two weeks ago Nix was made an honorary County Commissioner. "I think they're trying to get me to stop bringing that stuff out of Memphis," he said. The honorary position came complete with two big gold certificates. Nix plans to hang the certificates in Clarksdale's Blues Museum. Nix's loyalty to the Clarksdale cause is a little unusual since his personal music career began in Memphis, or at least at a Memphis high school. It all started one day when a performer named Elvis Presley made an appearance at Nix's high school. "We had never heard girls scream like that," Nix said as if still a little amazed. "We had never heard rock and roll music." Nix walked out of the auditorium and into the principal's office. "I told him I was quitting school," he said. "There was no need to go to school. I knew what I wanted to do — play rock and roll music." Nix's first venture into music was the purchase of a guitar. "I knew I'd never get away with that," he said. He settled on a saxophone "I didn't know how to play," he said. "I just bought a saxophone and figured it out." After a stint in Oklahoma playing with Indian bands, Nix came back to Memphis and ran into a group of boys from his high school that were also trying to learn to play music. "Everybody had bought instruments," Nix said. He said the group would go to all the black night clubs and listen to the bands to pick up technique and sound. The group of boys from the high school became the Mar-Keys. The Mar-Keys went on to sell 31/2 million records which included the number 14 chart song in 1961 —"Last Night." The group was on the road for about four years traveling by bus through 48 states. 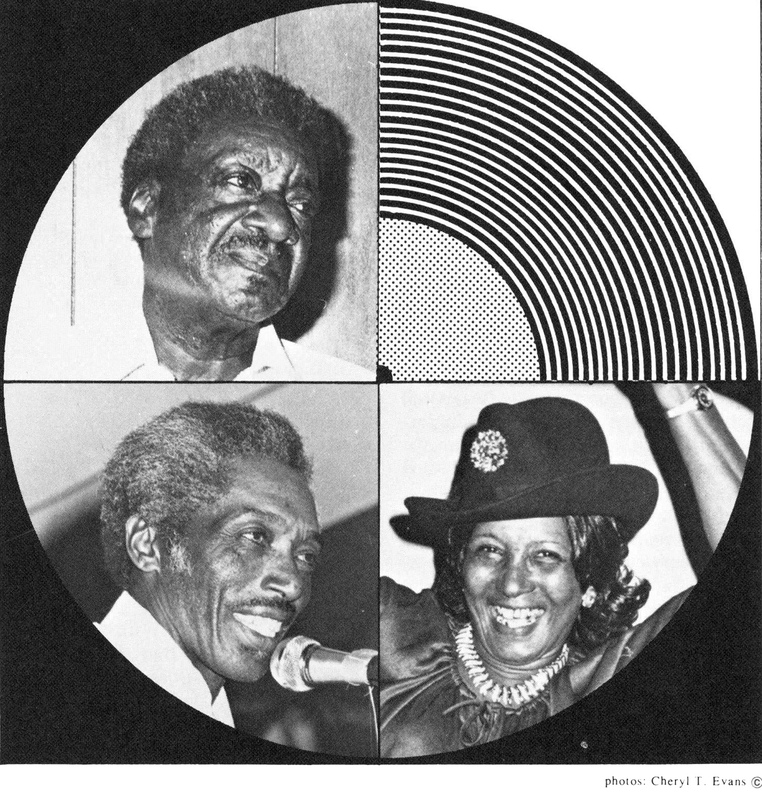 They became the house band for the famous Stax recording label playing behind artists like Otis Redding, Rufus and Carla Thomas, Eddie Floyd and William Bell. The Mar-Keys broke up and Nix moved on to California and an association with singer Leon Russell. During those years he commuted between California and Memphis to continue his work with Stax. His musical career has moved from performing to record producing to performing. He has produced 46 albums for other artists and recorded several of his own. Nix says that the high point of his career was the Concert for Bangladesh in 1971. He still carries a medallion commemorating his participation in the concert. His association with the benefit con-cert produced another bit of memories for the blues museum. When the exhibit officially opens May 15, a letter to Nix from George Harrison will be among the collection. 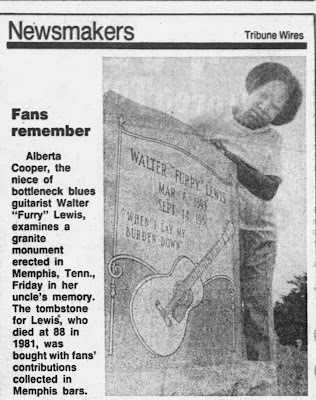 This week Nix is in the Memphis area again using his contacts and knowledge in the blues field to conjure up more items for the blues museum. He lived in Europe for several years and has an appreciation of love Europeans have for blues music. His albums always sold better on the other side of the Atlantic, and perhaps one reason for his concern for the local project is rooted there. "They come to this area expecting to find something here," Nix said of the tourist's hunt for blues artifacts. "But there is nothing." 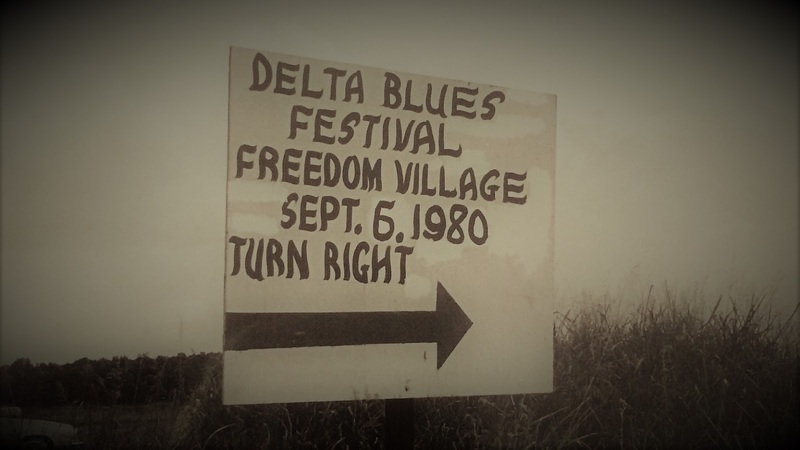 Through Nix's efforts there may soon be something for blues lovers to see in the area that gave birth to the music — that something will be the Delta Blues Museum.